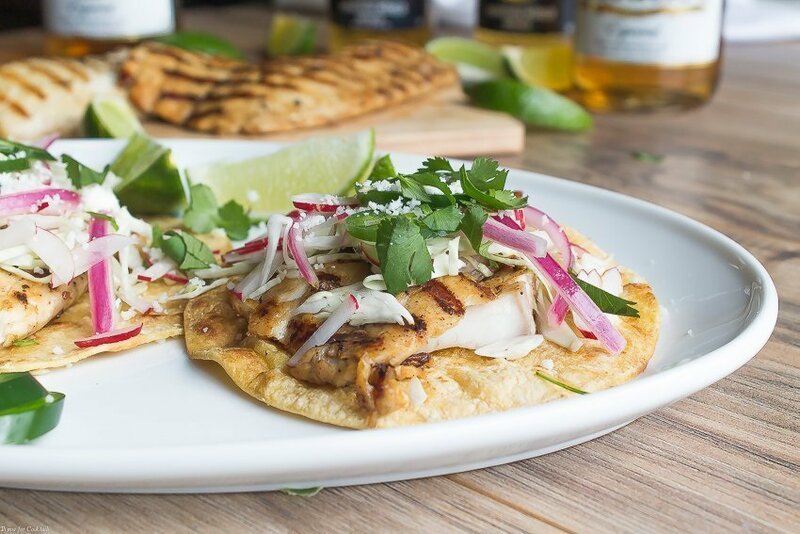 These Beer Marinated Grilled Fish Tacos will make the most of your Cinco de Mayo eats. They are the perfect way to celebrate with friends, along with an icy cold beer. 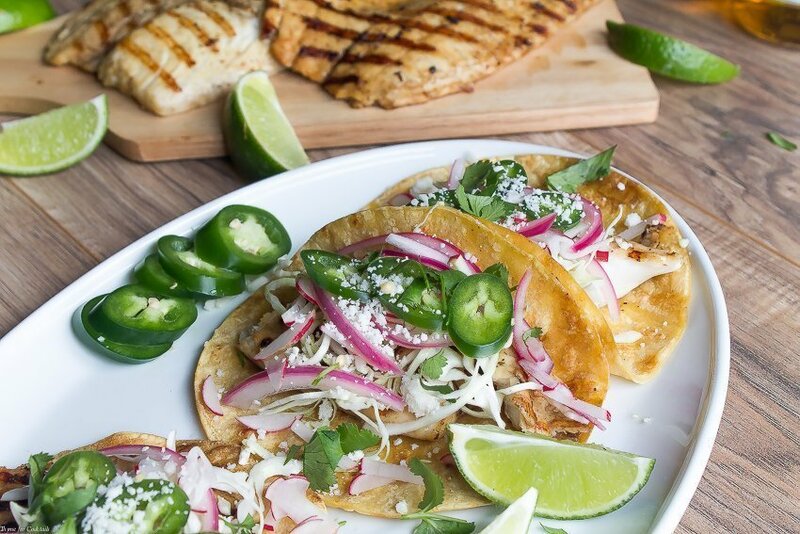 Classic tacos topped with shredded cabbage, radishes, pickled red onions, fresh jalapeno slices, and cojita cheese. I seriously did a little jump of joy when I got the idea for this recipe! The only thing Paul has ever asked me to make in our four+ years of marriage is fish tacos. They are his personal passion, next to a frosty cold beer of course. 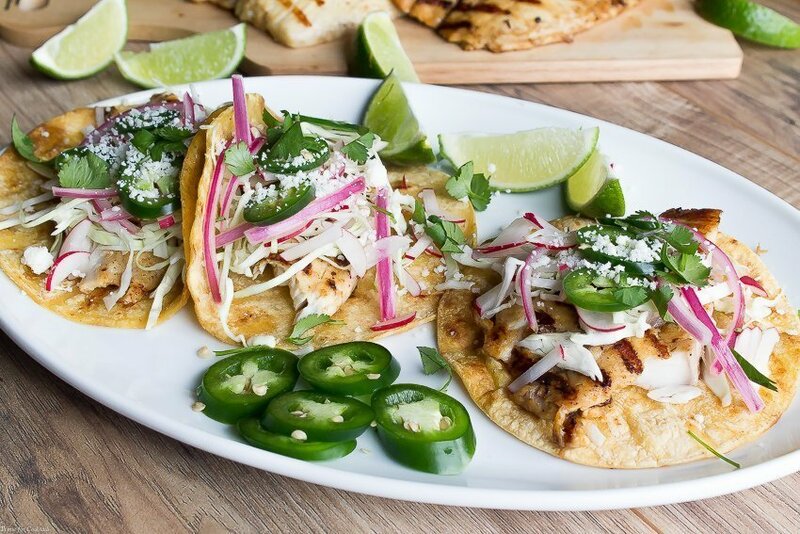 We agree we need beer and tacos for our Cinco de Mayo celebration. The question is what kind of tacos. 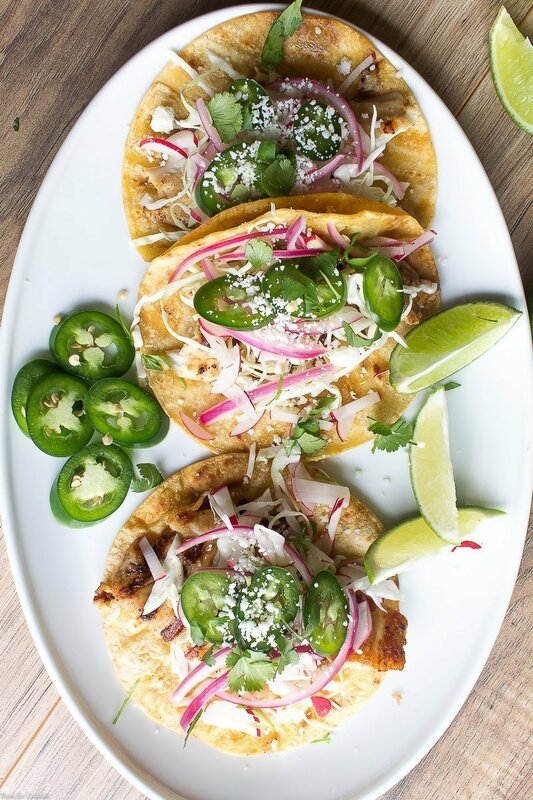 Tacos are our love language, so picking just one kind is very difficult. My vote is for steak, but the guys won me over with the idea of fish tacos. To be perfectly honest, seafood isn’t my thing. You won’t catch me eating sushi or slurping oysters, but I do like a simple plate of fish and chips, and of course killer Beer Marinated Grilled Fish Tacos. Since warmer weather begs for grilled recipes, we decided not to batter the fish. 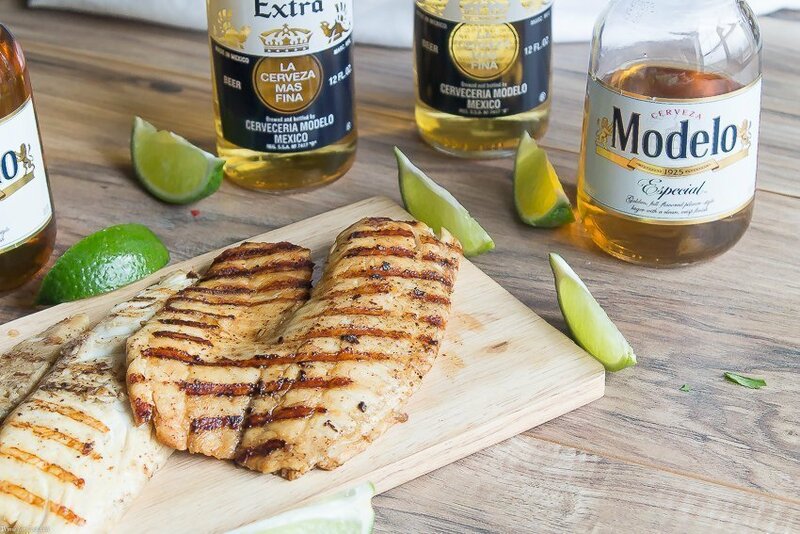 Tilapia, a mild white fish, tastes great with my beer chicken marinade. Paul is pretty happy I am expanding my culinary exploits and finally making more fish dishes. This marinade is something else folks. I make it with my favorite Mexican spices like chili powder, cumin, oregano, and coriander. Plenty of fresh garlic and a squeeze of lime juice adds depth of flavor. On top of that, did I mention there is beer in this marinade? Modelo Especial, a light, crisp pilsner-like lager, deliciously balances the tangy, spicy flavors. A well-balanced, clean finish and hints of orange blossom honey make it the model Mexican lager. 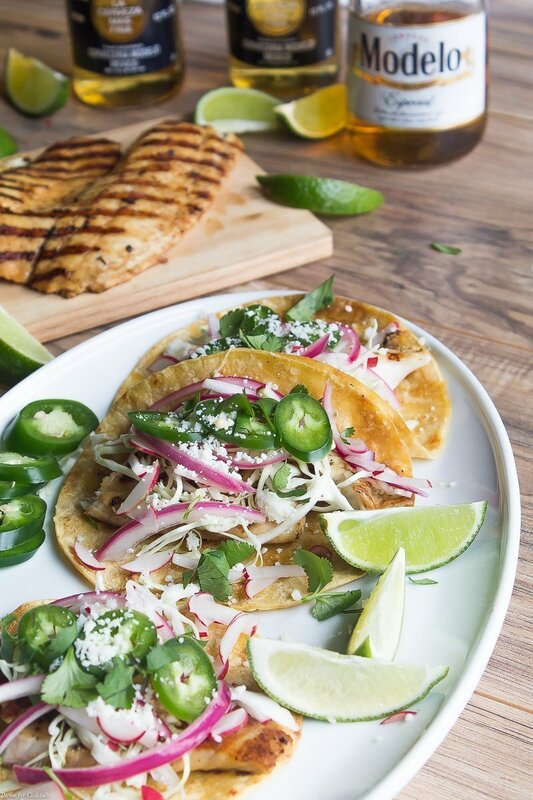 Corona Extra is also pretty tasty in this recipe, we know it pairs well with lime, right?! I typically marinate chicken in this mix overnight, but the fish only needs about 20-30 minutes if you are in a rush. Grill the fish outside, inside in a grill pan, or even bake it. Now about the toppings. 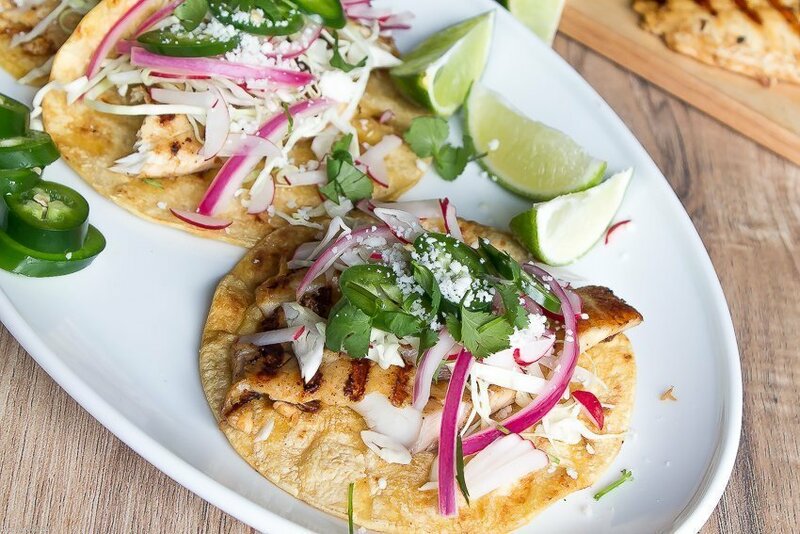 We like to keep it classic with cabbage, thinly sliced radishes, and pickled onions. A light, chipotle lime coleslaw would taste great, or even pickled red cabbage. Just keep it light, fresh, and a little acidic. Most of all, slice plenty of limes for the tacos, and the beer! 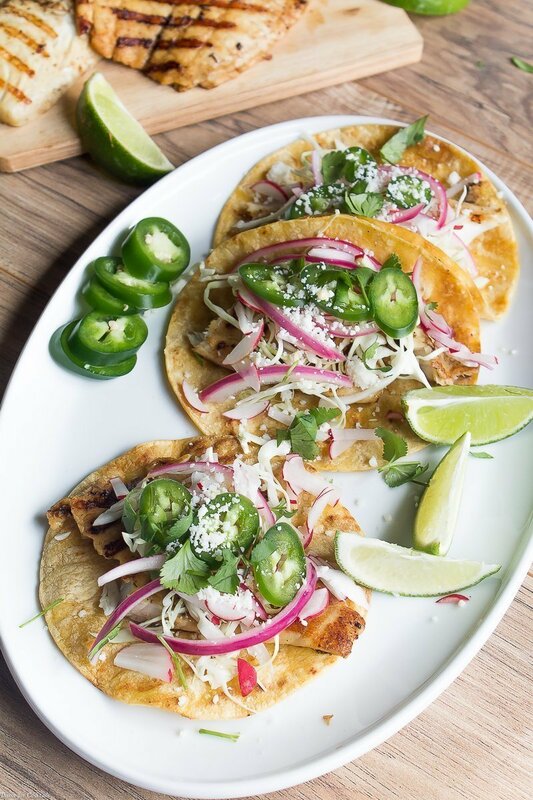 What is your favorite kind of taco? How are you celebrating Cinco de Mayo this year? 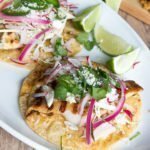 My Beer Marinated Grilled Fish Tacos are a stellar option! 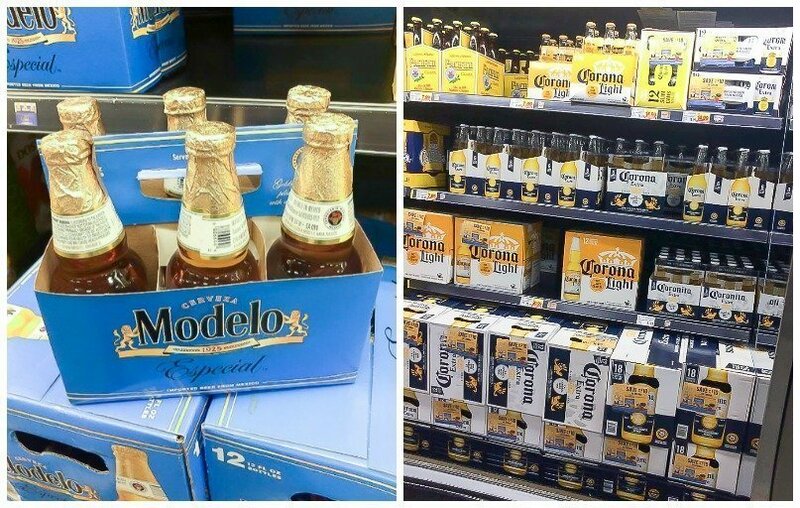 So pop a cold Modelo, slice limes for the Corona, and get ready to relax. 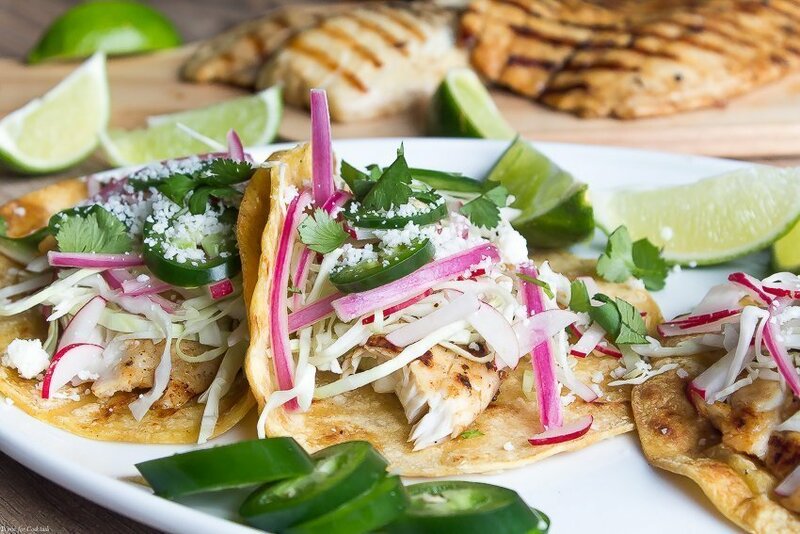 Beer Marinated Grilled Fish Tacos topped with shredded cabbage, thinly sliced radishes, pickled red onions, fresh jalapeno slices, and cojita cheese. Place fish, beer, oil, lime juice, garlic, and spices in a large zippered plastic bag. Refrigerate 20-30 minutes. Can be marinated overnight. Heat grill to medium heat, and lightly oil. Remove fish from marinade, pat with paper towels to remove excess liquid. Salt lightly. Grill fish 3-4 minutes on each side until done. Set aside to rest. Grill tortillas on each side. Evenly divide fish between tortillas. Garnish with desired toppings. Serve immediately.